It can be worn both in a sober and elegant spirit or in a chic and bohemian, depending on the style you want to give it: alone to highlight its authenticity or with other bracelets for a fun and trendy look, like a shamballa style. 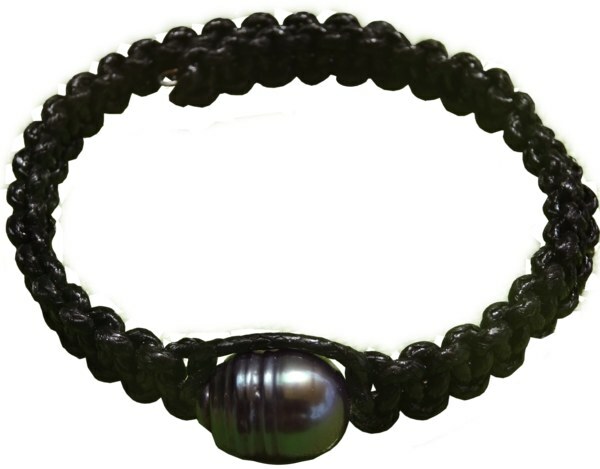 - a real Tahitian black pearl, baroque of about 8 mm : located in the center of the bracelet, each pearl is authentic and unique. - a soft braided cord made of durable polyester, approximately 5 mm wide. It is available in 3 colors and can be adapted to all wrist sizes. Whatever the color of the cord, the size is adjustable about 6 to 9 cm of diameter. The closure and/or adjustment system is different depending on the color. Sand Beige or Light Brown: closure system with sliding link with knots. Black: the cord is braided around a semi-rigid metal memory wire. Tahitian cultured pearls are commonly known as Black Pearls (or Poe Rava in Tahitian language - Poe: pearl and Rava: black), although they come in a multitude of colors by many natural factors. Every pearl is unique. In a spirit of quality approach, the service of the Perliculture of French Polynesia has set standards and regulations that define quality criteria to qualify the pearl culture of Tahiti. It corresponds to the diameter of the pearl in millimeters, which can vary between 8 and 16 mm. There are unusual pearls that are considered exceptional. For jewelery use, a tolerance of 0.5 mm is considered insignificant. Example: a pearl of 7 mm may actually have a diameter that can vary from 6.75 to 7.25 mm. - Semi-baroque: there are 4 shapes (drop, button, pear, oval). - Ringed: it has regular bands, rings or splines (perpendicular to an axis of rotation) and covers more than a third of the surface of the pearl. Note: Keshis are not cultured pearls formed around a nucleus grafted by a human hand, but pearls formed naturally in mother-of-pearl, with a diameter of 2 to 15mm. Generally small and without precise shape, they are mostly used in fanbcy jewelery. The surface of a pearl is more or less slick, with or without imperfections such as scratches, cracks, dents, bumps, etc. A smooth, perfect surface without any imperfection is exceptional. It is characterized by the reflection of the light on the surface of the pearl, its shine according to 4 grades: Excellent (very shiny, bright), Good (shiny), Pale (not shiny), Weak or poor (dull, matt). It comes from the duration of gestation within the pearl oyster. It is a guarantee of quality, beauty and durability of the cultured pearl. According to the official classification, a Tahitian cultured pearl must have a thickness of mother-of-pearl covering at least 80% of the surface of its nucleus. The natural color of the pearl depend on the light. It is therefore important to observe and compare its color in artificial light but also in natural light. The nuances can not be categorized because there is an infinity, varying between several colors and reflections: white, silver, cream, gold, gray, blue, pink, eggplant, green, yellow, peacock, pistachio, etc. Color combinations are also possible. Professionals recognize three characteristics: the base color (determined by the species of the producing mollusk, the area of ​​culture, the nature of the graft and the nucleus), traits (translucent secondary colors), the Orient (rainbow colors or iridescent that can be observed when the pearl is rotated). Note that the color and shape criteria are decisive in choosing a pearl and remain tied to personal taste. Pearl professionals use several graduation elements to qualify the pearl surface that is qualified with the naked eye. Another classification exists, such as GIA (Gemological Institute of America) standards that use the terms Gem Grade, AAA, AA +, AA. Tahitian black pearls are the result of secretions of mother-of-pearl from an oyster species called the Pinctada Margaritifera, a species mainly grown in the lagoons of French Polynesia. Pearl culture refers to the pearl oyster culture activity, in 5 steps. The Pinctada oyster Margaritifera lives naturally in the Polynesian lagoons. At certain times of the year, larvae are born, seeking to secure themselves from predators. The farmers place the collectors in the lagoon so that the larvae can find refuge there. Young oysters are collected and placed on underwater breeding devices called stations. The shell is pierced and the oysters are attached by a nylon along a string which is placed under the surface of the sea. The growth of Nacres is closely monitored (disease or predators). Oysters are grafted from the age of 2 years. The grafting operation consists of inserting into the pearling pouch a nucleus (a ball cut into the mother-of-pearl of a mold) which will constitute the heart of the cultured pearl, and a graft (piece cut out of the mantle of another oyster called donor). The nucleus and the graft must be in contact. The graft forms in the bearing oyster a bag around the nucleus (called perlier bag), in which the pearl will develop. This plays a decisive role in the quality and characteristics of the future pearl, because of its secretion activity around the nucleus. It determines in particular its color. It takes another 2 years to allow the oyster to grow. Several parameters participate to produce a pearl of quality: the physiological state of the oysters intended for the grafting, the know-how of the personn how graft, the quality of nucleus and graft, the conditions of breeding of the oysters during all the process. After 5 years, the pearls can be harvested. If the pearl is of an exceptional quality, a second graft (called surgreffe) is then performed. The pearl is then replaced by a nucleus of the size of the pearl harvested, without adding additional graft. The oysters can be grafted two to three times, which allows to obtain a bigger pearl.